Is Tari calling for an illegal meeting? In typical progressive politics, Tari Renner wants to beat the Council into voting on the Welcoming Ordinance. Nothing is posted yet on the City website, but somehow the Pantagraph knows this meeting is going to take place on Monday. Yes, more proof the media prints what they are told to print! Supporters of illegal immigration want the Council to declare laws don’t matter. They want open borders without consequences. They don’t care if the illegals are gang members, terrorists, drug runners, or child traffickers. Without ICE America is flooded with them! Any ordinance protecting people here illegally is a slap in the face to people who legally immigrated here. I’m hearing the new ordinance version is so watered down it does nothing, but these people will declare a victory if the Council is foolish enough to pass it. Facts don’t matter, they just want submission. You are looking at the reason civility can not exist in Bloomington-Normal. When laws and those who enforce it aren’t granted respect, the conversation ended before it began. It is illegal to hold a meeting in a room that does not allow everybody who wants to attend to attend. According to the rag, 350 people attended when it was at the BCPA. 350 won’t fit in the Council Chambers. If you are sick of progressives beating up elected officials to get what they want, show up. You don’t have to speak. The only thing needed to stop this nonsense is enough bodies to keep the meeting from happening. We just celebrated Independence from Great Britain. Many fought and died for your freedom. It is your duty to preserve it for future generations. Show up Monday at 5:30! Posted in BloNo, Bloomington, BLOOMINGTON CITY COUNCIL, elections, Liberal Media, Local, Progressives, Renner.Tagged welcoming ordinance. Funny how progressives extoll the virtues of inclusiveness/togetherness yet their strategy is to intimidate government leaders, no doubt threating to call them racists if they disagree, speak loudly over any other voices/opinions, and using messages and branding of violence like a fist for a logo. These are the types of groups that are beginning to control more and more of the Bloomington-Normal community. It will continue if the majority stays home! Well they definitely pick a good name for thier sick little group misfits, after all that appears to be what they are trying to do to the law abiding people of the city of Bloomington. Do these people support human trafficking? Cause there is alot of that going on at the southern border due to the mass migration. Nefarious people make big money off this situation. As always, follow the money. If the borders were patroled and enforced like they should be, there would be much less explotation of those people. Legal immigration is so much a better way than attempted mob rule. The Sonny Garcias of the world are foolish pawns of the extreme wealthy. So ignorant. So sad. 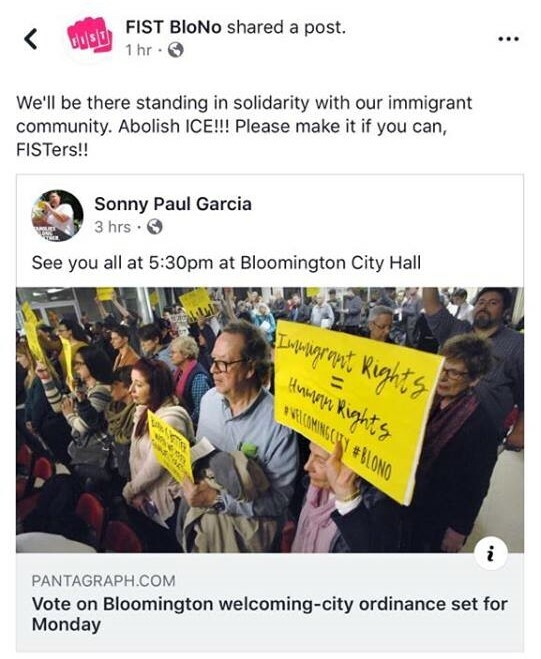 The hysteria, hyperbole and threats of violence that spew from these groups generates more fear in the community than any threat of ICE showing up in Bloomington. They intimidate then claim to be victims. I’m sick of their behavior. Not to people who govern based on feelings instead of laws. This kind of ordinance is about as effective as declaring a community a gun sanctuary. A gun ordinance defends the second amendment. An ordinance protecting people not here legally does what? What part of the LAW does it defend? Feelings? Rich, I have to agree that this ordinance is totally ineffective and is not worth the paper it is written on nor the Staff time used to formulate it. Meanwhile he potholes get deeper, the streets get worse, garbage piles up and people get killed. OUR COUNCIL AND MAYOR ARE AS USLESS AS TEATS on a boar! No wonder Diana is leaving! Maybe she is the ONLY one who has a brain and Tari appointed her. WHAT does that tell you?? Why is it if this was a Tea Party protest it would be all patriotic and legal? If it’s citizens outraged and protesting its government tearing away children from their parents, it’s illegal and should be stopped. Everyone, coming here legally and illegally are are ensured rights of due process, enshrined by the 14th Amendment, from the Constitution. You know that document that you think your supporting. You know, all that patriotic gobbledygook you wax poetic about on the 4th of July. The day after, you want all protest that you don’t agree with stopped. I guess if it’s about, you, it’s important, if it’s about some powerless refugee, let’s throw them in cages and deny them their rights.The Trump administration despite its Executive Order and the legal order from a federal court, are still holding over 3,000 young children from their parents. ICE was at the center of this debacle. They were so incompetent that they did not keep any records as they were cruelly separating parents from children even babies. What department in its depravity tells young children that their parents don’t love them? What department laughs at young toddlers crying for their parents? ICE does. Why is it that you can call for all kinds of departments to disband, but a department that’s clearly abusing its power is sacrosanct? Those coming here illegally and legally through the southern boarder have rights, rights that have been grievously taken away from them. Apparently being Christian and being a human being doesn’t cross anyone’s mind that this is morally wrong. When the history of this is written, this will be a dark mark on this country’s reputation. For shame. @ Cents & Common sense,,,then you support human trafficking? Do you also support the immense exploitation of these people or are you so filled with disdain for those you disagree with you that you conveinently ignore the reality of the situation? Do you support the conditions of how some of these people arrive such as stuffed in the back of a box truck with no outside area in 100 degree heat? I suppose you also support the treck through the desert of which many of the elderly and children don’t even make it here. I guess you think that it’s all a pleasant trip to get here (illegally). And the smullglers of human capital,,,yes I said human capital cuase that’s how they view these people. How much money do you think it costs to be smuggled in? Oh, you thought it was free? Lol. Perhaps when the parents make the decision to bring their own kids across the border illegally they should be realizing that it is they that are taking the chance that their family will be split up and that they should bear responsibility for their actions. instead blame it on somebody else. Blame it on the folks that are against the illegal framework and USE THE CHILDREN, exploit the children and play the victim. Hey, I’m real sick of this victim card stuff for people that do this to escape the accountability for their own actions. Sick of it. And sick of idiots like you even more. We have more legal citizens, legal children in this country than ever before living at poverty level or below. Have you forgotten about those children? You don’t mention them. You don’t mention the children of Yemen or Palestine. How about abortion? What’s your stand on that? Now you go and blame Trump for what Obama did for 8 years! Whatever! Now you go and blame the Tea Party for what Obama did for 8 years. Hey people are waking up! Red wave in November. Might as well just WalkAway from the demon-rat party like the ones who still hve a little sense left. I support legal immigration. And as far as being Christian is concerned, let’s teach a man to fish so he can feed himself for life. If you are so holier than thou, then please start with Hilliary and Obama and ask them to donate 1/2 of their wealth to help these pour souls. @Cents—Your comments are misdirected. The immigration laws currently being enforced were in place long before Trump was elected. It is the Executive branch’s duty to secure our nation’s borders. National politics have no place mingled in local politics. There are no children being snatched from their parents in Bloomington except the young black youth dying from gun violence. There are no illegal immigrants living in Bloomington being deported or detained. The local advocates should be petitioning the Federal government for immigration reform. A local “welcoming ordinance” does nothing to help with immigration reform. The worst part is that those demanding a “welcoming ordinance” are threatening violence if they don’t get their way. No one on this blog has ever threatened violence. No one on this blog has ever celebrated the fact children being separated from their parents. Unfortunately, that policy was made during the Obama administration. Additionally, the blame for the separation ultimately falls on the parents who brought their children here illegally.